The Water's Cool, But the Action's Hot! 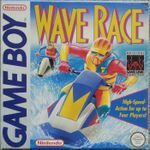 Jump aboard your Personal Water Craft and hit the waves! Pick one of three versatile PWC - the nimble 550c, the speedy 650cc, or the high-powered 800cc National Class racer. Splash your way through 8 tracks in the racing circuit. Or complete in 8 different breackneck slalom courses. Watch the spray fly as you leave your opponents swamped in your wake! Save your quickest lap and course times. Race to top your fastest speed. Or, challenge up to three of your friends with the Four Player Adapter an pour on the power. Four player fun requires four Game Boy systems, four game paks, and a Game Boy Four-Player Adapter. Sold separately.